SALT LAKE CITY – Today Huntsman Cancer Foundation (HCF) announced that several individuals and business organizations have committed a total of $40 million to support a proposed major building expansion of Huntsman Cancer Institute (HCI) at the University of Utah (U of U). The announcement of these historic gifts was made by Peter Huntsman, HCF Chairman and CEO, at HCF’s annual gala held this evening at the Grand America Hotel in Salt Lake City. The lead donors to the project include Spencer and Kristen Kirk in honor of Kathryn F. Kirk, The Church of Jesus Christ of Latter-day Saints Humanitarian Aid Fund and doTERRA International. The funding will support a proposal to significantly expand the Cancer Hospital at HCI, part of the University of Utah Health system. The proposed addition would extend from the north end of HCI’s existing buildings on the campus of the U of U in Salt Lake City. 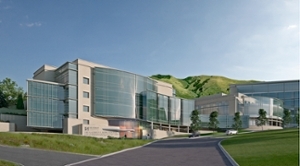 The expansion will be called, The Kathryn F. Kirk Center for Comprehensive Cancer Care and Women’s Cancers at Huntsman Cancer Institute, and add an additional 100,000 square feet to HCI’s cancer campus, including up to 50 additional inpatient rooms and workspace for oncology specialists. The new proposed structure would also expand the number of procedure, consultation and outpatient exam rooms and would increase the size of the HCI’s Linda B. and Robert B. Wiggins Wellness and Integrative Health Center. The plan for the remaining project funds of the estimated $80 million project will be finalized in the coming months. The next step is a review of the proposal by appropriate approval bodies, including the U of U Board of Trustees, the Utah State Legislature and key U of U building oversight committees. The proposed project timeline estimates construction would begin in December 2019, with an opening planned for fall 2022.